The location of the container is important. Specific rules about the placement of LPGas containers can be found in the National Fire Protection Association’s (NFPA)58. There are standards for ASME above ground containers, ASME underground containers, and DOT cylinders. One of the most important dimensions given is the distance to a source of ignition. In most cases, this should be at least 10 feet. Verify that the containers you inspect are properly located in accordance with NFPA-58. Also verify that the container location is accessible for safe filling from the bulk delivery truck. The container should be resting on a firm, non-combustible foundation, and cleared of weeds and grass from under or around the container. Be sure to check with your local fire and building authorities for additional installation requirements. The location of the container is important. Specific rules about the placement of LPGas containers can be found in the National Fire Protection AssociationÕs (NFPA)58. There are standards for ASME above ground containers, ASME underground containers, and DOT cylinders. One of the most important dimensions given is the distance to a source of ignition. In most cases, this should be at least 10 feet. Verify that the containers you install are properly located in accordance with NFPA-58. Also verify that the container location is accessible for safe filling from the bulk delivery truck. 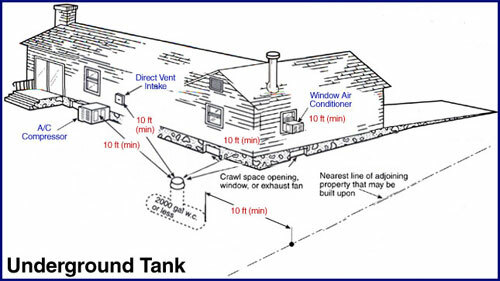 Note 1- The relief valve, filling connection, and liquid level guage vent connection at the container must be at least 10 ft. from any exterior source of ignition, openings into direct-vent appliances, or mechanical ventilation air intakes. 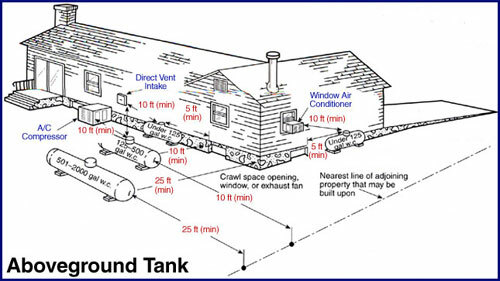 Note 2- No part of an underground tank shall be less than 10 ft. from an important building or line of adjoining property that may be built upon. 3.1.1 Clearances. Underground gas piping shall be installed with sufficient clearance from any other underground structure to avoid contact therewith, to allow maintenance, and to protect against damage from proximity to other structures. In addition, underground plastic piping shall be installed with sufficient clearance, or shall be insulated from any source of heat so as to prevent the heat from impairing the serviceability of the pipe. 3.1.2 Protection Against Damage. Means shall be provided to prevent excessive stressing of the piping where there is heavy vehicular traffic, or soil conditions are unstable and settling of piping or foundation walls could occur. Piping shall be buried or covered in a manner so as to protect the piping from the physical damage. Piping shall be protected from physical damage where it passes through flower beds, shrub beds, and other such cultivated areas where such damage is reasonably excepted. (a) Cover requirements. Underground piping systems shall be installed with at least 18 in. (46 cm) of cover. The cover shall be permitted to be reduced to 12 in. (30 cm) if external damage to the pipe is not likely to result. If a minimum of 12 in (30 cm) of cover cannot be maintained, the pipe shall be installed in conduit or bridged (shielded). (b) Trenches. The trench shall be graded so that the pipe has a firm, substantially continuous bearing on the bottom of the trench. (c) Backfilling. Where flooding of the trench is done to consolidate the backfill, care shall be exercised to see that the pipe is not floated from its bearing on the trench bottom. 3.1.3 Protection Against Corrosion. Gas piping in contact with earth or other material that could corrode the piping shall be protected against corrosion in an approved manner. When dissimilar metals are joined underground, an insulating coupling or fitting shall be used. Piping shall not be laid in contact with cinders. Uncoated threaded or socket welded joints shall not be used in piping in contact with soil or where internal or external crevice corrosion is known to occur. 3.1.4 Protection Against Freezing. Where the formation of hydrates or ice is known to occur, piping shall be protected against freezing. NOTE: The gas supplier can be consulted for recommendations. 3.1.5 Piping Through Foundation Wall. Underground piping, where installed below grade through the outer foundation or basement wall of a building, shall be encased in a protective pipe. The annular space between the gas piping and the sleeve shall be sealed at the foundation or basement wall to prevent entry of gas or water. 3.1.6 Piping Underground Beneath Buildings. Where the installation of gas piping underground beneath buildings is unavoidable, the piping shall be encased in an approved conduit designed to withstand the superimposed loads. The conduit shall extend into a normally usable and accessible portion of the building and, at the point where the conduit terminates in the building, the space between the conduit and the gas piping shall be sealed to prevent the possible entrance of any gas leakage. If the end sealing is of a type that will retain the full pressure of the pipe, the conduit shall be designed for the same pressure as the pipe. The conduit shall extend at least 4 in. (10 cm) outside the building, be vented above grade to the outside, and be installed so as to prevent the entrance of water and insects.